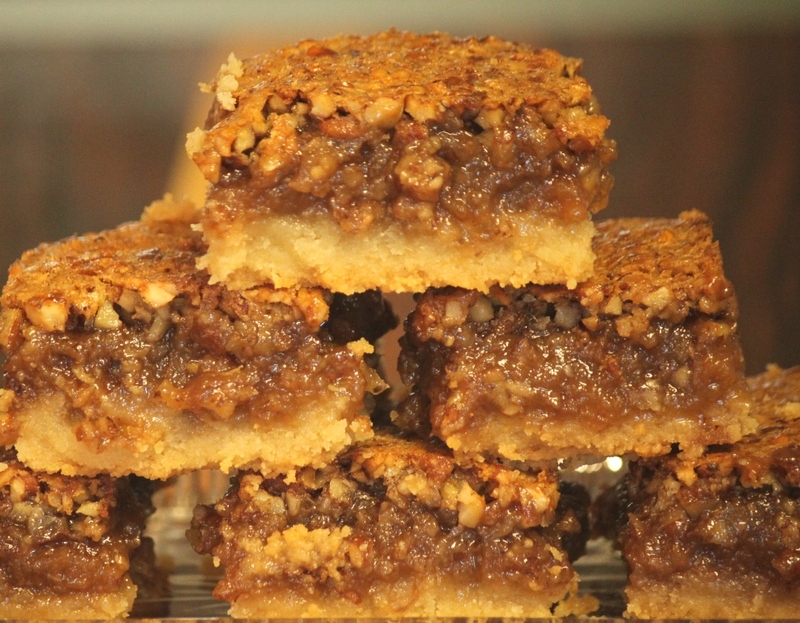 Pecan Pie Bars | Rosetta Bakes! Who can resist Southern Pecan Pie? Not me, that’s for sure! This dessert bar makes you feel like you are actually eating a slice of pecan pie, it’s that good! I can’t say where I got the recipe from, I just know I’ve had it a long long time. This dessert bar makes you want to pull out the whipped cream that’s for sure…if you like me, and love whipped cream on pecan pie! Combine flour, sugar and salt in a bowl. Cut in 3/4 cup butter throughly with a pastry blender or food processor. Press evenly into a greased 13 x 9 ” pan and bake at 350 for 17 to 20 minutes. Combine brown sugar, corn syrup and 1/2 cup butter in a saucepan. Bring to a boil over medium heat, stirring gently. Remove from heat and stir in one-fourth of hot mixture into the beaten eggs. Make sure you whisk or mix fast as you add the hot mixture to the eggs so the eggs will not start cooking. This is called tempering. Once you have the one-fourth hot mixture to the eggs, you can slowly add the rest, whisking or mixing as you pour it in. Stir in pecans and vanilla. Pour filling over the crust. Bake at 350 F for 32 to 35 minutes or until set. Cool. yield 16 large bars. « Rolo in the Middle!